From Pinsk, on 13 January 2007 at 06:30 am I took a minibus going on the Pinsk – Olshany route on my way to the confluence point of 52°N 27°E. I got off the bus on the outskirts of the village of Berezhnoe, where the point is located. After walking for about 200 meters at 8:30 am I was on the spot. 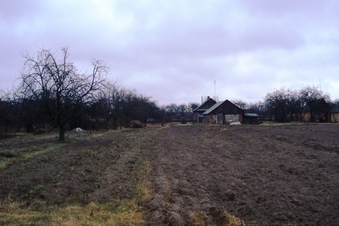 The point is located within one of the farm settlements in the village. The weather was so bad (awfully windy and rainy) that no one even noticed I got on the farm to record the next point. Half an hour after I reached the point it started raining really badly, and walked in this rain all the way to Stolin. From there I was to catch a bus to a bridge on the Pripiat river near Pinsk, which was my starting point to next confluence. I hitchhiked to Stolin. In the same manner I got to the aforementioned bridge. From this point I walked to my next place of destination: 52°N 26°E.